"The Narrow Road to the Deep North" is not a mystery. It won this year's Man Booker Prize. I have had mixed feelings about some of the other Man Booker winners in the past. I kept falling asleep while reading one of the prize-winners many years ago. (I never did finish that book!) I really liked "The Luminaries," last year's winner. 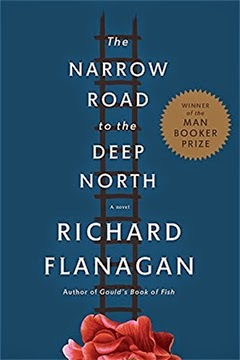 Australian author Richard Flanagan has a terrific half a book. Dorrigo Evans, a Tasmanian surgeon, lives the horror of life as a POW in a Japanese work camp during WWII. The descriptions are graphic and heart-rending. The misery of the work camp will seep into your air, your mood, and your general everyday thought as long as you are reading this book. What did anyone -- prisoner or Japanese guard -- do to deserve being placed in the hellhole of Siam, building a Sisyphean railway? Just as I thought about another sweeping historical classic, "Gone With the Wind," so, too, do I apply this judgment to one-half of Flanagan's book: I don't give a damn. The POW part, I laud, applaud, and congratulate Flanagan on a job well done. If a person kills an older or younger version of him- or herself, is it murder, suicide, sci-fi, magic, or just really, really strange? It is questions like this that have made Jonathan Carroll a cult figure. Maybe it was that the wind changed (à la Mary Poppins), but I suddenly felt in the mood to read “The Wooden Sea,” a book that has been tickling the back of my mind for a while. It is a goofy, thought-provoking, funny/serious book. Indeed, there are murders, thus qualifying it for this blog (not that lack thereof has stopped me from writing about a book), and witty, hefty helpings about the mystery of life. But I can see why this book might not appeal to everyone. Frannie McCabe is the chief of police of Crane’s View, New York, the town in which he grew up. He was more likely to be on the opposite side of the jail cell in his youth, but the Vietnam War and an overdue maturity have settled him. He has a wonderful wife, a shy stepdaughter, and a three-and-a-half-legged, one-eyed, droopy dog named Old Vertue. Frannie is happy with his life and is good at his job. After all, he solved (off-stage) only the second murder Crane’s View ever had. What then is Frannie to do when his three-legged dog expires, is buried, and resurfaces — still dead — in the trunk of his car the next day? By the way, instead of smelling corpse-like, Old Vertue exudes all the smells that Frannie finds most wonderful and evocative. How about when Frannie discovers that a battling couple — regulars on the call circuit — has mysteriously disappeared from their home? And someone(s) has tidied and scrubbed their once disgustingly chaotic house (and it smells wonderful). One minute they are screaming at each other and the next they are gone. The neighbors, standing watch outside the home and waiting for the police to show, did not see the couple leave. Hmmm. Why do a colorful feather and a sweet-tasting bone-but-not-bone pop up every which way Frannie turns? Why did the corpse of a dead teenage girl talk to him? Who is the stranger who apparently can stop time? Is he an angel? Why is Frannie sent into his future sixty-something-year-old body to live his last week on earth? And the story just gets stranger and stranger. Underneath the strangeness, Carroll tells the story about a regular kind of guy, someone you might be happy to have in your life. Yeah, he was a hellraiser and nasty piece of work when he was younger, but the past is long gone. Isn’t it? Frannie must travel on an existential journey to find the meaning of his life and what his true purpose might be, and it is to Carroll’s great credit that he keeps that journey moving right along from strange event to even stranger event and gives it an everyman voice besides. Before you know it, you are at the end. Has Frannie learned anything? More importantly, do you know how to row on a wooden sea? “Death in Sardinia” is the third book in the Inspector Bordelli series set in Florence, Italy. Although it appears that this book (and others in the series) may be a little difficult to get, it will be worth the struggle. Marco Vichi has set this book in 1965 and has done a fabulous job of introducing elements from that era, Italian style. There are two (or three or four, depending on your point of view) separate stories for a reader’s delectation. The main story involves Inspector Bordelli, with all his faults and glory. The inspector travels Florence’s back alleys and country tracks to solve the murder of a brutal loan shark. In the process, we meet his friends, not all of whom are totally on the right side of the law. They all mingle, sometimes quite congenially. For instance, Botta, a minor criminal who has spent time in prisons all over the place, is an excellent and picky cook, and a good friend of Bordelli. He is charged with producing the Christmas Eve feast for Bordelli and other friends. 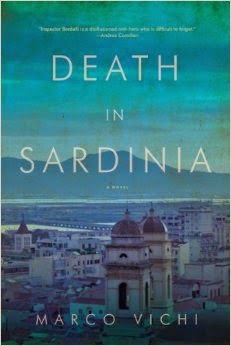 Sometimes reading “Death in Sardinia” was like mixing “Babette’s Feast” with poliziotteschi. But it worked! The secondary story involves one of Bordelli’s fellow detectives, the young Piras, who has gone home to Sardinia to recuperate from an injury suffered in the line of duty. Christmas in Sardinia in 1965 has a small-town charm. Because not everyone has a television set, neighbors join Piras’ parents to watch theirs, reinforcing the bonds of their tight community. The brother of a neighbor, a country farmer, has been found dead in his living room, a probable victim of suicide. Piras suspects something fishy, but he can’t quite put his finger on it. There are 464 pages that Piras shares with Bordelli, so it’s okay that both stories are drawn out to include personal details about the two heroes. Vichi excels in providing the realistic (and often humorous) details of the detectives’ lives. For instance, Piras has a girlfriend, Sonia, and he talks with her frequently by telephone. He doesn’t wish to discuss her with his parents, especially his mother. She employs not-so-discreet subterfuge to find out more about the girlfriend. Piras is “tricked” into revealing his girlfriend’s name is “Francesca.” Piras’ mother is happy, and Piras is happy to have successfully concealed information about Sonia. Bordelli has an eccentric and vivacious girlfriend, the prostitute Rosa. In his mid-fifties, Bordelli regrets many past relationships and missed opportunities. He treasures Rosa but they are not moving towards marriage, and that suits them both. He was a young man during WWII and scenes from that horrible time haunt him almost daily. American soldiers were able to come home to an America physically unscathed by the bombs of war, but Bordelli and his countrypeople had to live with physical and political reconstruction. Enemies needed to be forgiven in order for Italy to move forward. Vichi writes a moving narration when telling about those times and expediencies. “Death in Sardinia” has a richness and color that exceeds the basic level needed to tell the crime stories. In the end, will Bordelli do what is right according to the law or according to his moral lights? P.S. I recently read a book in which the author said that when a person commits suicide with a gun, it is impossible to hold on to the gun. In the Sardinian part of the story, the dead farmer is found clutching the gun. I thought, aha!, is that the trick? But no, that wasn’t a part of the story. I only cry a bit, and it’s shocked crying, not boo-hoo crying, and when I’m done I go to the mirror. My eyes’re a bit puffy, but a bit of eyeliner soon sorts that out … Dab of lippy, bit of blushers … Sorted. When I first moved to Dooneen Cottage — a quarter of a century ago — I couldn’t have plucked a hen if my life depended on it. Now I can stun, decapitate, and gut one as casually as Mam used to make a beef and Guinness stew. Holly has several parts to play in the war between the Anchorites of the Dusk Chapel of the Blind Cathar of the Thomasite Monastery of Sidelhorn Pass (or just “Anchorites,” if you please) and the Horologists (if they have a lengthier name, I don’t remember it). They are immortals (or close enough), but they can die for real (“die-die”). 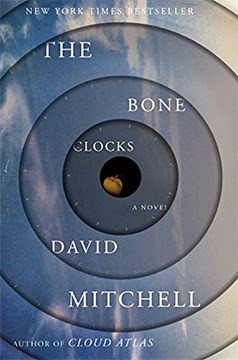 “The Bone Clocks” includes a narrative, as realistic as can be, by a journalist about life and death in a Middle East war zone. It also includes the whinging of a deluded, narcissistic author (responsible for the quote in the first paragraph). How about a rebellious 15-year-old girl who runs away from home? Most of the stories run swiftly along, most excellently combining Mitchell’s quirky turns of phrase and the voice of the character. However, it all comes to a thunking halt when the story turns to the Anchorites v. the Horologists about three-fourths through the book. How well does Mitchell succeed in his attempt to mix some very serious and real issues facing our world with a far-out battle of immortals? It’s fascinating and awkward at the same time. Fascinating because Mitchell’s creativity is way off the charts. Awkward because the pace goes from zipping along to suddenly stuttering because of the vocabulary, back story, and suddenly larger cast of characters needed to explain this supernatural competition. Mitchell ends with a story about the aftermath. Not the aftermath of the battle, but the aftermath of the human negligence of our world. Why didn't the immortals intercede? In general, they didn’t seem to have a major impact on our world. The Anchorites demanded scant human sacrifices and the Horologists didn’t, but no one on either side was a world leader or author of economic policy. Maybe their actions were like butterfly wings, flapping and rippling into hurricanes. There needs to be applause for Mitchell’s writing (with not a cliché in sight), his willingness to be a different sort of storyteller, his intelligence in presenting diverse topics, and his ability to be absolutely riveting. He is an extraordinary literary acrobat. P.S. Yes, there are murders. And the whole book is full of mysterious goings-on. Despite many mysterious elements, I can’t categorize this as a legitimate mystery. 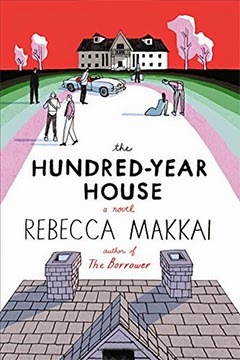 Rebecca Makkai builds her story around a mansion. It may be haunted. It may be illustrious. It may be the scene of murder, abuse, fraud, and hanky-panky. She presents her book in several parts, each part going back further in time in the life of the house. In 1999, a professor and her PhD. candidate husband move into the carriage house in back of the mansion. The professor’s mother and her current husband live in the mansion. Soon the current husband’s son and his wife also move into the carriage house. She is an artist (of dubious quality) and he has just lost $5 million dollars as a financial analyst and been fired from his job. The professor turns out to be conniving — she could be the little sister of Amy from “Gone Girl.” Cross that with “A Comedy of Errors.” Throw in a ghost story. Throw in an artists’ colony. Makkai is clever in the construction of the story. 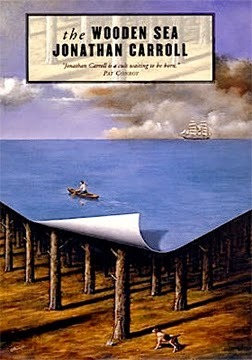 If you read this book, pay attention; there will be a test. I wish there had been more of a ghostly component. 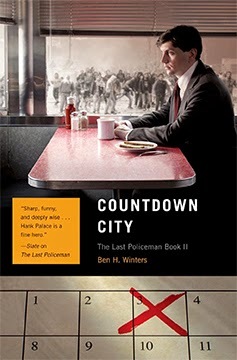 Rule Number One: You must have read “The Last Policeman,” the first book in Ben H. Winters’ series, for “Countdown City,” the second book, to make any sense. Rule Number Two: There is no rule number two. There are very few rules left in Concord, New Hampshire, where Henry Palace used to be a police detective. The “authorities” have consolidated and Henry and his fellow homicide detectives are out of a job. And all this because of a wayward asteroid headed for a disastrous rendezvous with Earth seventy-seven days from the beginning of this volume of “The Last Policeman” trilogy. What would you do if you potentially only had seventy-seven days to live? Henry keeps his sanity by simply living his life according to the ethical and legal rules he has always known. He and his sister, Nico, grew up in the area, so when his former babysitter, Martha, needs help, she comes to him. Martha’s husband was a state trooper and much admired. He gave it up to work with her father in a pizza pie restaurant. He was good and faithful and true, or so Martha believes. But suddenly, after asteroid Maia became public knowledge, he disappeared. Martha wants Henry to find him. With the Internet down, the police/security/military forces simply holding chaos at bay, and electricity shut down, what chance does Henry have to find Brett? But Henry being Henry, he has to try. Through Henry’s eyes, Winters presents the slow disintegration of a vital city. Almost nothing and no one can be counted on any longer. (At one point, Henry sees his childhood dentist hanging from a light pole, dressed in leather, directing an unruly mob.) After Henry was released from the police force, he no longer had access to a car and must now travel everywhere by foot or bicycle. He is accompanied most places, no matter how far away, by his dog, Houdini (acquired in the first episode). To track Brett, Henry travels perilously through ad hoc strongholds. He meets crazy people, people on the edge of being crazy, and clear-eyed lunatics. There are some people he can still count on. His maybe-crazy sister comes to his aid at one point. An old colleague from the detective squad gives him strength and assurance. Ruth-Ann, a fixture at the diner where Henry and other detectives used to eat, still dons her waitress uniform, pulls out her pencil and pad and takes orders, despite a dwindling supply of food. At the end, there is only tea to offer, but the diner remains a still point in the chaos. And that is what book two is about: the descent into chaos, with new rules and new allies. The center cannot hold, but Henry tries his best. Winters has written a real detective story and combined it with a dark look at human beings on the point of potential destruction. It makes for a powerful story. Winters’ writing is strong and elegant enough to carry the story forward, without being schmaltsy, tawdry or pandering. Luckily book three, “World of Trouble,” was just released. I would have hated to have had to wait a year in between each book. Forward and onward. Just a reminder that you can subscribe to this blog by selecting the email button to the right.